This classic birthday card showcases black and white retro style lettering that form the words, "Happy Birthday Make A Wish". Very stylish! 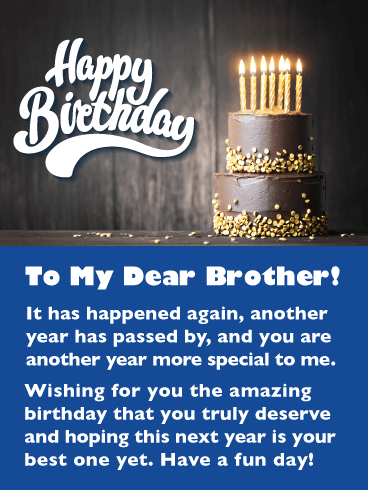 Best of all, this birthday card mentions that he is not only your brother, but that he is also your good friend. So special! He will love everything this thoughtful birthday card has to say. Send it over to your brother for his special day to make sure he knows you are thinking of him today. HAPPY BIRTHDAY make a wish - Dear brother, hope you receive everything you wish for this year. You deserve the best! Thanks for being such a great brother and a good friend. Make a toast to your brother on his special day with this retro happy birthday card! It has a vintage look that will grab your brother's attention, making it a must send! It displays an old style illustration of someone holding up a shot glass in a traditional toast style, and saying cheers! It's perfect for the occasion, your brother's birthday! 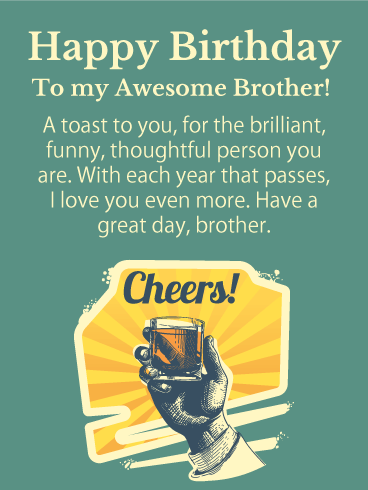 Send this birthday card your brother's way to toast his celebration day! 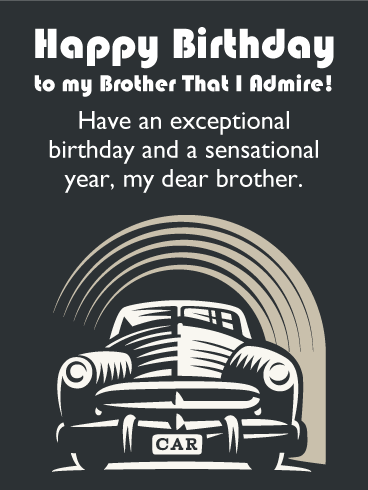 Wish your brother an exceptional birthday and a sensational year with this fantastic vintage style birthday card! It features an illustration of a classic car that has an artistic flair. Whether or not your brother has an appreciation for stylish vintage cars, he is going to really like this creative birthday card. Let him know that you admire him by putting this car in drive and getting it over to him in time for his birthday this year! 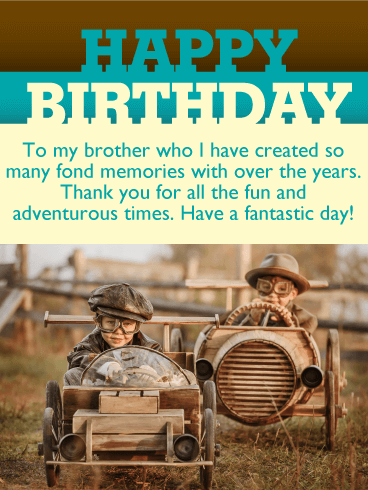 If you appreciate all the fun and adventurous times you and your brother had while growing up, then this vintage style birthday card would be a great way to let him know. The kids are dressed in old style clothing while riding vintage cars! 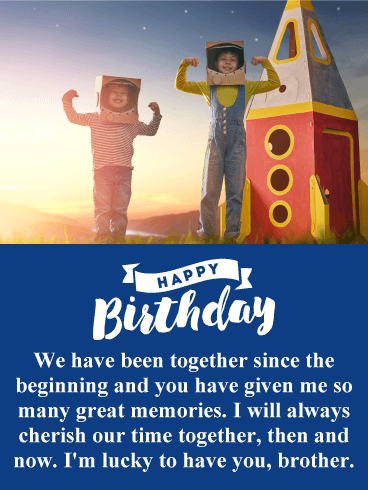 You will not only be wishing your brother a happy birthday with this greeting card, you will be bringing back memories of his childhood, it will put a smile on his face as he reflects back. 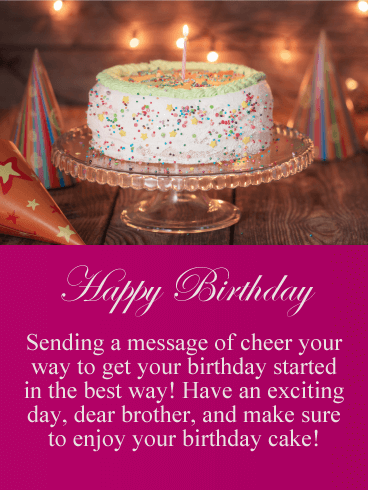 Send this uplifting and inspirational birthday card to your brother this year to get his special day started in an exceptional way! 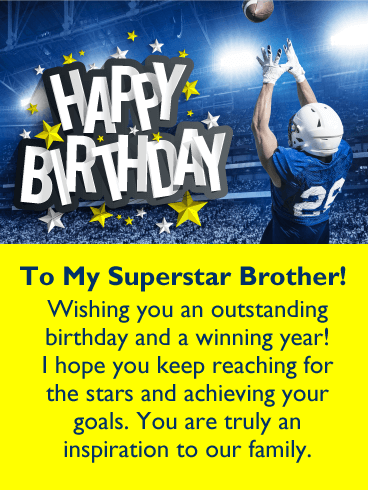 It features a football player going for the winning catch, stars bursting from the words, "Happy Birthday", and a positive message. 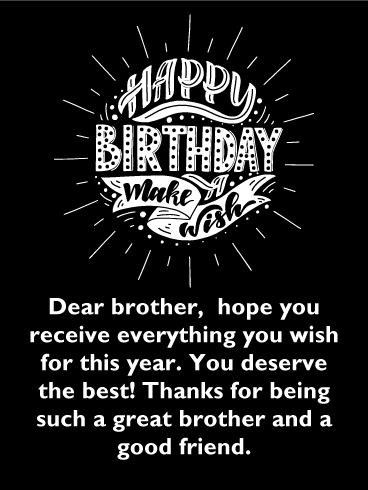 This greeting card wishes your brother an outstanding birthday and a winning year. It also encourages him to keep reaching for the stars. Your brother is going to feel very inspired after reading this birthday card! If you are looking for a colorful and festive birthday card for your brother this year, you just found it! This fun birthday card will certainly get the celebration started! It displays 3 bright candles, artistic Happy Birthday lettering, and thoughtful words! The message explains that you hope all his birthday wishes come true this year! Your brother will be so happy that you sent this greeting card! So don't delay, send this awesome birthday card out now! 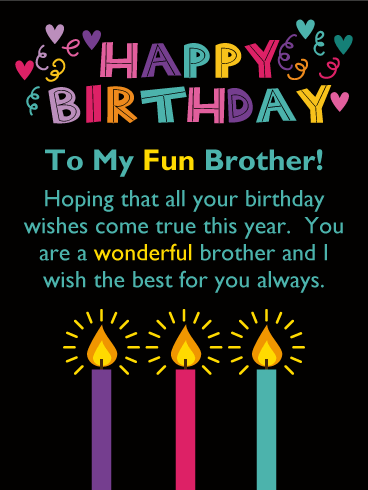 This colorful birthday card will add excitement to your brother's special day! It features festive lettering that form the words, "Happy Birthday BRO". The message is the best part of this greeting card, it says that you appreciate him and that you could not have asked for a better brother. It's a thoughtful and touching statement that he will enjoy reading. 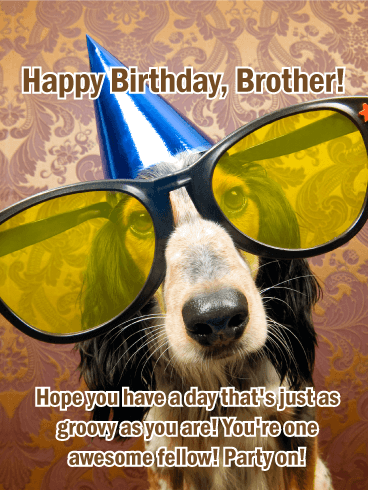 Don't delay, send this birthday card out to wish your brother a fun and exciting day! 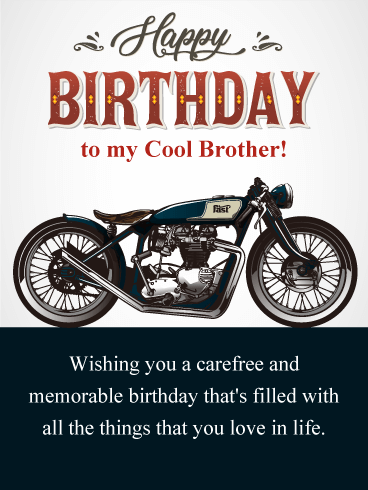 This vintage motorcycle birthday card will get your brother's birthday off to an awesome start. It features a classic bike that any motorcycle fan would love to own, and will certainly add some excitement to his birthday this year! 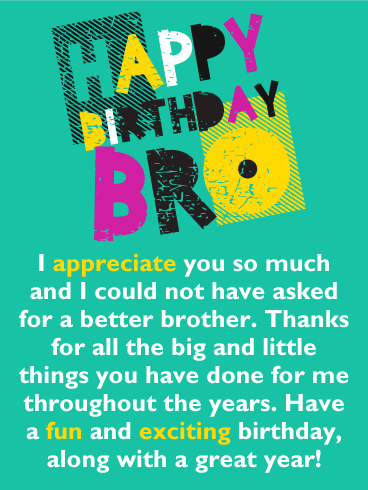 Send this must have greeting card out to your cool brother to wish him a carefree and memorable birthday. He will appreciate the fact that you selected a special birthday card just for him! This special birthday card will touch your brother's heart as he starts to recall his childhood memories of the two of you. It showcases a great image of a brother and sister playing, having fun, and spending quality time together. Expect a call from your brother because after he reads that you feel lucky to have him, he will want to connect with you. This birthday card will certainly be a hit with your brother this year! Make sure to brighten your brother's day with this birthday card that contains celebration balloons floating in a sparkling sky and a joyful message that your brother will love. 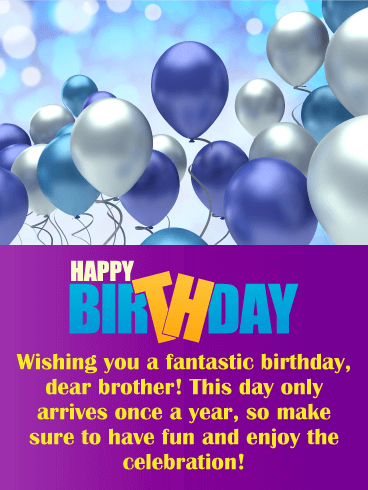 It will allow you to wish your brother a fantastic birthday and remind him to have fun and celebrate. After all, a birthday only comes around once a year! Send this festive birthday card his way so that he receives it in time for his special day! Send your brother the essential birthday items for his special day, a yummy birthday cake and party hats! It will allow his celebration to start the moment he sees this birthday card! You can also send him a message of cheer and wishes for an exciting day with this fantastic greeting card. Get these party hats and birthday cake over to your brother soon so he can start the party and enjoy his birthday!